I always had a passion for horses as a little girl. I would muck out stalls for hours on end in exchange for a ten minute ride. The simple truth was, my family just didn’t have enough money to support my interest, so I put it in the back of my mind for many, many years. At age 55, I discovered a nice horse farm close to our home. I began taking riding lessons. Within a few months, the love I had felt for horses as a child came surging back. It struck me that I had been working as a Nurse Anesthetist for over 30 years, and it was about time that I fulfilled this dream. After an exhaustive search, I was extremely fortunate to find my forever horse- The Liberator, a Missouri Fox Trotter. I wanted a gaited horse because I had ridden one as a child, and when I found my Libby, there was no doubt in my mind that he was the one. So I packed him up and took him home to my lesson farm. I figured I would rely heavily on the horse owners around me to learn the things I had to know to have a happy horse, and be a happy rider. So, one of the first and most important learning issues I encountered was that of appropriate tack.I had bought a beautiful dressage saddle from his previous owner-wonderful slick black leather that made me feel very insecure as a got to know my boy. I decided that at my age, and with very limited experience, I should buy a western saddle. Hopefully it would give me a little something to hold onto. So I bought myself a low-end synthetic western saddle and plowed ahead on my journey to understand, ride, and encourage the best from this beautiful new being in my life. I read everything I could on the gaited horse, went to clinics, asked advise, and tried to utilize the resources around me. Libby seemed a little stiff to me at times, and I had trouble getting him to gait properly. He seemed to fall in and out of a number of gaits, none of which I could initiate or maintain for any length of time. I attributed my problems (and his) to my inexperience as a rider/owner. I loved every moment that we spent together on the trail, doing fun shows, hunter paces, and endurance training. Still, I felt that something was not quite right. In the winter of 2010 I attended the World Horse Expo in Harrisburg, Pennsylvania, where I met Gary Lane. Both of us had served in the Army in Saudi Arabia and Iraq during the first Gulf War, and this shared experience helped form a friendship and mentorship in which I began to understand my horse to a much greater degree. I bought his book, “Training the Gaited Horse From the Trail to the Rail.” I bought Gary’s CD’s. I took to heart his motto that I was ...”not an interruption to his day, but the purpose of it...” And, believe me, every time I had a question, I picked up the phone, and Gary was happy to help. In the spring of 2012, I finally talked Gary into coming to New Jersey to do a gaited clinic. The wonderful woman I had bought Libby from graciously offered her farm to do the clinic. I was so excited and proud that he would finally meet my Liberator. Well, he did meet Libby, and to my dismay, found that he was suffering with considerable sacro-iliac joint pain. So much so, that he suggested that I not ride him in the second day of my own clinic! Gary did point out the pressure points that my western saddle had been causing. He was very concerned that this beautiful horse of mine may have a serious back problem that might not be fixable. Immediately after the clinic, I had Libby treated by a very good equine vet/ chiropractor. Gary, and his wife Ruthie, had been in the process of developing a saddle specifically for the gaited horse and his unique needs. Called the Gary Lane Lady Lite saddle, it is also designed to meet the unique aspects of the anatomy of the female rider (although it is appropriate and comfortable for the male rider as well). Needless to say, I bought Gary and Ruthie’s saddle. It has been a home run for me in a number of ways. First and foremost, it is comfortable for my horse. Since using this saddle, he has never shown any evidence of back soreness again. It is so important to realize that the gaited horse moves differently, and requires the use of a saddle that addresses these differences. When I took Libby to the World Horse Expo in Maryland this past January, Gary was very impressed with how much better he was moving, commenting that he was “100% better.” What a relief!! In March I attended another of Gary’s clinics in Maryland. By that time, Libby was gaiting with much more ease and comfort. We are a happier pair! Of equal importance is the fact that the saddle is perfect for me. Now at age 60, and with a torn right rotator cuff, the saddle is light (21 pounds), and I am able to lift it easily onto his back. The leather is soft to the touch, and the design is beautiful. 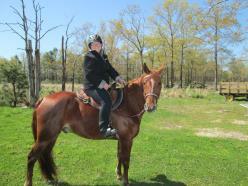 I do alot of distance trail riding, and I always feel totally secure, and very comfortable. I have been told that my position has improved greatly since using the saddle, a fact that I attribute to the placement of the leathers which allow for a dressage-like leg position that occurs very naturally. I was never encouraged by the Lanes to buy their equipment and materials. It was just something that made sense to me, and worked for me. One of the things I have learned is that our horses are at our mercy when it comes to what we put on their backs, and in their mouths, and how this is all paramount to how they will be able to do their jobs for us. Finding Gary and Ruthie’s saddle has taken the guesswork out of tacking my horse properly. The saddle is wonderful, and enables me to continue my horsemanship journey in true style and comfort.